A lumbar laminectomy, also commonly referred to as decompression surgery or decompressive laminectomy, is a spinal surgery that can help alleviate pressure from the nerves of the spine. Spinal degeneration can cause portions of the spine to narrow, putting pressure on the spinal nerves. This spinal pressure is referred to as spinal stenosis. A lumbar laminectomy removes the lamina bones, which are the roof-like bones that cover the spinal column. The removal of the lamina bones can help alleviate the pressure from the spinal nerves. What part of the spine is treated during a lumbar laminectomy? During decompression surgery, Dr. Rozbruch will place an incision on the lower back. Spinal decompression surgery involves the removal of the lamina bones, which attach to the back of the spine. The lamina and pedicle bones form a ring that encases the spinal column. 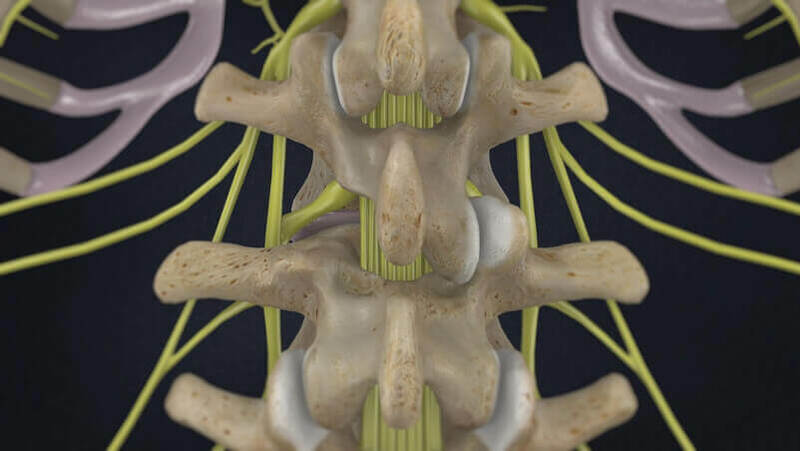 During a lumbar laminectomy surgery, spinal surgeons can also remove bone spurs from the facet joints that run along the back of the spinal column. The removal of bone spurs can help alleviate the pressure placed on the nerves of the spine. What can lumbar laminectomy help achieve? Spine decompression surgery can reduce spinal stenosis symptoms. Spinal degeneration can cause a disc to weaken or become damaged, resulting in the possibility that the outer rim of the disc may bulge outward. If left untreated, a bulging disc can protrude or rupture into the canal of the spine, which can narrow the overall size of the canal. A reduction in the size of the spinal canal can lead to symptoms of spinal stenosis. Spinal degeneration can also cause the development of bone spurs, which often form around the facet joints and around the spinal vertebrae. If a bone spur points into the column of the spine, it can press against the spinal nerves. With lumbar laminectomy surgery, the bone spurs and a section of the lamina bone can be removed to reduce pressure on the spinal nerves. This will also enlarge the spinal canal to provide more room for the spinal nerves. How can I prepare for lumbar laminectomy surgery? Prior to spinal decompression surgery, it may be suggested that you undergo a physical to ensure that you are a candidate for spinal surgery. It is important not to eat or drink after midnight the night before your lumbar laminectomy surgery. Dr. Rozbruch can provide you with additional directions to follow the days leading up to your lumbar laminectomy. What can I expect from a lumbar laminectomy? Decompression surgery is performed under general anesthesia because it induces sleep for a more comfortable procedure. With general anesthesia, a ventilator may be used to assist and monitor your breathing during your spinal decompression surgery. During some spinal surgeries, a spinal anesthesia may be used, which helps to numb the lower limbs and back. In addition to spinal anesthesia, medicine will also be administered to keep you comfortably sedated. A special frame is used so that you may comfortably relax during a decompressive laminectomy. The frame, which allows you to rest while kneeling face down, alleviates any pressure within the abdomen. Kneeling face down can also help to reduce the amount of blood loss during decompression surgery. A small incision will be made in the middle of the lower back to begin your spinal decompression surgery. The skin, tissues, and muscles of the back will be gently separated to uncover the spinal column. A spinal X-ray may be performed at this point during your decompression surgery to ensure that Dr. Rozbruch is treating the correct vertebra. During a complete laminectomy, the bony projection off the vertebra, otherwise known as the spinous process, and the lamina on either side are removed. Dr. Rozbruch will place an incision on the interior edge of the facet joint on either side and remove the lamina bones entirely on the vertebra being treated. The next step during spinal decompression surgery is to remove a section of spinal ligaments, which extend down the spinal canal in between the spinal cord and lamina bones. By removing a section of spinal ligaments, Dr. Rozbruch is now able to see the spinal nerves. Some tissues around these spinal nerves may be removed, along with any disc fragments. If you have any bone spurs, they will also be removed at this step in your lumbar laminectomy. The removal of disc fragments and bone spurs helps to alleviate pressure from the spinal nerves. The muscles and tissues are then gently put back in place, followed by Dr. Rozbruch administering sutures to the external incision. What can I expect after a lumbar laminectomy? Following spine decompression surgery, many patients are able to carefully get out of bed within a few hours of their procedure. We suggest moving gently and being cautious with your back, as to not irritate the healing incision or muscles. Dr. Rozbruch will be able to estimate when you will be able to return home based on your overall health and medical condition following surgery. In most cases, this is the day after a decompressive laminectomy. Driving is prohibited for 1-2 weeks following spinal surgery. Light activity can resume within 1 month; whereas intensive activity must be postponed for 2-3 months. How can I learn more about lumbar laminectomy? To learn more about lumbar laminectomy, please request an appointment online or call Dr. Rozbruch’s orthopedic office in NYC at 212-744-9857. Prior to an office visit, please fill out Dr. Rozbruch’s patient forms to expedite your first visit.